Well, 2016 is just about over, and I am happy to announce that I have FINALLY completed the Reading Challenge that I so eagerly undertook in January! The second-to-last step of the Challenge really held me up. “Read a Book That Intimidates You.” At first I thought this was a preposterous notion… I never realized how many books could, in fact, intimidate me! Many of these fell into the Self-Help category. One had something to do with “Ex-aholics,” and another was a “classic” by Louise Hay (You Can Heal Your Life) that mysteriously showed up in my mailbox with no return address. I made it only part-way through the former and read the latter in its entirety. I don’t feel comfortable using the Louise Hay book in this category, because it requires one to “do the work,” so to speak, and I was not willing to do the tasks it required. (One involved looking in the mirror and saying positive affirmations every day. No can do.) I guess you can say I was still intimidated by the book after reading it. I felt like a failure. Ultimately, I resorted to an old high school enemy: William Shakespeare. Of all the books I was forced–I mean ASSIGNED– to read in High School, I only remember hating “Wuthering Heights” and every book by Shakespeare. I guess it’s because of the mind-bending Early Modern English he utilized in his writing; it’s sort of like reading a book in a foreign language that you barely have a grip on. If you have to pause to mentally translate every sentence, it certainly takes away the enjoyment that ought to come with reading a book (or in this case, a play). So I decided to “cheat.” Rather than the original Shakespearean text, I checked out a modern translation by a local author, David Andalora. Dave is a special education teacher who has translated several adaptations of Shakespeare’s works into “Today Speak,” so that they can be read quickly and easily, with none of the original content lost in translation. Rather than the over-exposed “Romeo and Juliet,” I decided to take on MacBeth, a play believed to have been performed as early as 1606. . I much prefer tragedies over comedies, and Will Shakespeare was renowned for both. Reading MacBeth in “plain speak” was surprisingly easy and even fun. It was a darkly interesting psychological study into what atrocities humans commit when driven by greed, and how Evil can snowball and spiral out of control. I was surprised at the extent of the violent, bloody nature of Macbeth’s crimes, and wondered how they could have believably pulled this off onstage four hundred years ago. I understand that the three witches were there partly for comic relief and more so, because they foreshadowed how Macbeth’s downfall would come about. However, I couldn’t help but wonder if Shakespeare’s portrayal stoked the public frenzy that caused hundreds of supposed “witches” to be hunted, unjustly tried, and killed from the 1500s to the early 1800s. (No wonder Modern Day Wiccans are usually very secretive about their religion!) Anyway, I would still not read Shakespeare’s works in their original form, but I’d give another of Mr. Andalora’s translations a try. How many times have I read Little House in the Big Woods, by Laura Ingalls Wilder? Who knows… a couple dozen, at least, starting at around eight or nine years old. 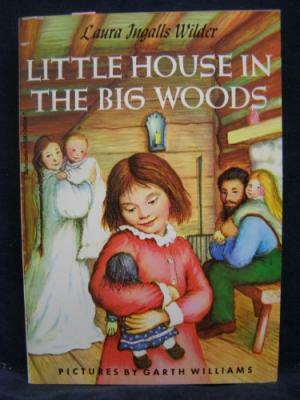 At first, I was curious to read it because of the TV series “Little House on the Prairie,” but even at that young age, I realized that Laura’s real-life childhood was very different from the television portrayal. As an only child with a “Ma” but no “Pa,” I completely immersed myself in the happy little Ingalls family– which then consisted of just Ma, Pa, Mary, Laura and little Baby Carrie. I wanted to live in that little log cabin and eat fresh bear meat that Pa had hunted, to help churn the butter, to sleep in a straw mattress bed in a loft, and to ride in a covered wagon to Grandma and Grandpa’s house, deep in the deep Wisconsin woods. Even though Pa was stricts and spanked Laura when she was bad, he would gently explain afterwards why she’d deserved it. There was no questioning the love in that family, even though they never actually uttered the words “I Love You.” It didn’t need to be verbalized to be understood and felt. The closing passage, in LHITBW touched me profoundly as a third grade girl, and still brings tears to my eyes everytime I read it. Such profound thoughts for such a young girl! But, as we know… time marches on. Every Today will become a Yesterday, and eventually a blip in history, entirely forgotten. Unless we make a difference in our own way. And so concludes my 2016 Reading Challenge. I think I will create my own categories for next year. Happy New Year,Kind Readers! Best of luck with everything in your lives!